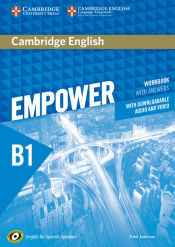 El autor de Cambridge English Empower for Spanish Speakers B1 Workbook with Answers, with Downloadable Audio and Video, con isbn 978-84-9036-900-5, es Peter Anderson, esta publicación tiene noventa y seis páginas. Otros libros de Anderson, Peter son Cambridge English Empower For Spanish Speakers B1+ Workbook With Answers, With Downloadable Audio And Video, Amigo O Enemigo? . Ocupacion, Colaboracion Y Violencia Selectiva En La Guerra Civil y Cambridge English Empower For Spanish Speakers A2 Workbook With Answers, With Downloadable Audio And Video.